I smell so terrible that sitting here I can smell myself. I probably shouldn't be in public subjecting other people to my stench, but I suppose most of the people here have had a day very similar to mine. Clean up at STI continues. We've spent almost the last week working up at the facility and so far it's including mundane tasks like sweeping, scooping debris out of tanks, nailing old displays back into place. And then occasionally we have only slightly more entertaining tasks like building new shelves or shoveling sand into place behind Gerry's tank. Granted all the work leads to the same outcome and we leave everyday drenched with sweat, stinky and absolutely exhausted. Fortunately the power in my apartment came back on a few days ago so I've spent two lovely nights in the air conditioning listening to music as I fall asleep. The first night, after only about 30 minutes of power, I went to bed in a still warm apartment only to wake in the middle of the night to a sensation I no longer recognized. I was cold. Having a refrigerator, at least recently, seems like an incredible luxury. Disasters like this tend to put things in perspective, even though the tougher camping part, in reality, only lasted a few days. I want NOTHING more than to go home and take a cold shower so I'll end with a little list of thank yous. Two different days we've had volunteers who brought lunch to everyone working at STI - it was such a generous gesture and was very appreciated. We've had lots of encouragement from people around the city and we periodically have people stopping in to check on progress - also appreciated. SPI and PI have been very generous with all of the locals and we've really benefited from the ice, water and food they were handing out. Today I went to the local clinic where they were giving free tetanus shots - granted the shot hurt and I'll be sore tomorrow, but it was a great way to keep all these hard working people healthy given the conditions. And lastly I want to thank the Port Isabel Library and my librarian. I came in today with a bunch of books that were due the day before the hurricane and were very late, but they are not charging fines for any ones overdue books right now. Thank you thank you to everyone. STI is healing and looking better in part because of all of your help and support, you really do help us push forward. Tari - Thank you for the offer, but we actually have a couple generators up at STI now so I think we're set. Connie - We'd love to meet you, I hope you will be able to come down to TX after all. Chrissy - Thank you for your thoughts! I'm so glad you were able to see STI in all it's glory, it's a bit of mess now. Thank you for all of the messages and positive thinking that you've been sending our way. All but one of the interns stayed on the island through the storm (and though it was quite an adventure in retrospect maybe it wasn't the safest option). STI was hit pretty badly, there should be an update and more information about the damage on the STI homepage or news page and eventually there will be pictures of the damage and clean up work on the site as well. Water was finally restored, but because the electricity will probably be out for another week I'm not sure when I'll be able to blog next, but keep checking - it'll be up eventually. Keep thinking positive thoughts...trying to sleep in south Texas with no air conditioning and no real ventilation or breeze through the house is getting to be unbearable. Yesterday at work we had a mother and daughter visit us and help out throughout the day. The mother is very passionate about sea turtles and together they traveled from Arizona just to spend a week volunteering at STI. She's also a loyal reader of my blog so we of course get along just beautifully. Anyway work was slow so we spent a lot of time talking with them and learning about other sea turtle experiences around the states. They are fascinating people and it was a spirited and very interesting conversation. Occasionally we have school groups, boy scout troops, college classes, etc. make special arrangements for a tour at STI, which is great, public education is one of the most important things we do as an organization. So yesterday we had on our schedule a group of 20 people from San Benito. Fabulous. The BIG problem with this however was that they were scheduled from 3:45 to 4:45. We close at 4. Now as interns we work hard all day long and put on a happy face no matter how we really feel, but once the clock hits 3:30 we're getting itchy and counting down the last half hour. So granted when we realized someone, very obviously none of us, had scheduled a group for a time slot after we normally close we were less than thrilled. At 3:30 someone calls in to confirm the time and says they are on their way, which peeved us even more, we were hoping they wouldn’t show. We gave the last tour of the day and closed to the public like we normally do and all six of the interns who were working stood around waiting for the group that was already 20 minutes late. So we’re waiting. And move around a little and wait some more. And go out side to look for a bus and wait some more. Then we let in some other people that pulled up since we were already their waiting. At about 4:35, 50 minutes after the scheduled time, we see a Hummer limo drive by STI, turn on the left blinker and begin to turn around. So granted we are all standing there, jawed dropped thinking “no way, there is absolutely no way” when they awkwardly park outside. Then we all stand there at the entrance and watch as 20 15-year old kids pile out of the limo, all of the girls with up-dos and some of the boys in tux shirts. 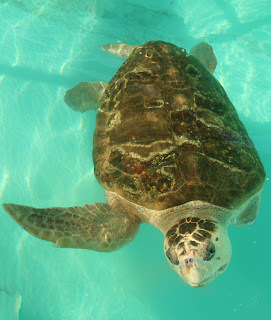 As it turns out it was quinceañera party, though I’m not sure who thought visiting a sea turtle rescue center to occupying the kids before the party was a good idea. Four of the interns split up the tour to make things easier for us and this group seemed so indifferent to everything that we said that it made everything that much more frustrating. They book a tour for after hours, show up extremely late and then aren’t even interested. We were all so annoyed with the situation that we decided to get together and have a big barbecue for dinner, so the whole crew came over to our house for a potluck and movie night. Of course the instant we left work we were all happier, but it was so nice for all of us to eat together. I’m on corral duty tonight, though I’m not sure if there are supposed to be babies. Either way it will give me time to catch up on some reading. The picture is of Angel, the little green we just released, on the boat. Be suspicious of Hummer limos. The joy of this job is that it is so dynamic and unique that for us living and working on the island is more like a high-stress vacation than a real job. This afternoon after sleeping in, taking my time to eat a late lunch and get ready to run errands I checked my email and was welcomed with an email from my boss from Southwestern University. I love working as a RA at school, but it's a different sort of job and was a bit of a kick in the face. What a lovely reminder that I have only a few weeks left on the island before I return the world of roommate conflicts, chemistry labs and cafeteria food. Sorry that my sarcasm doesn't quite transfer the same over the internet. Other than my semi-painful realization that I do actually have to pop my little island bubble and return to the real world I've had a fabulous last few days. One of my close friends from school came into town to visit for a few days so we crammed as much of the SPI experience into his time as possible. We went to Badabing Bagels for lunch, which by the way was fabulous - it was my first time to eat lunch there. And luckily Preston was here for Angel's release, which is always fun and emotional for the whole STI crew. We love going on the dolphin watch and sunset cruise and of course there's nothing quite like watching a little green fly from the boat and disappear into the ocean. Today at work we tagged Angel to prepare for her release and I got to pit tag her and tag her with the metal tag. The little stinker scraped my knuckle, but I figure I hurt her more (those metal tags don't look too pleasant) so we're even. Or close at least. After the release a group of us went to Dirty Al's for fried shrimp (they finally opened again a few days ago), then met up with a few friends from Mexico at Louie's. Of course to top off the full sea turtle adventure we went to the hatchling release this morning followed by a breakfast burrito. It was nice for us to catch up, I've been a bit out of touch with my former life since Spain. As always work was an escapade. We had a group of librarians and assorted cameramen from SFA to film around STI for a video in a virtual excursion series they are doing for students in their area. They were a lovely group of people who I really enjoyed talking to and they interviewed Jeff and I, taped a tour and some of the morning feeding. It sounded like an incredible project, part of their goal is to inspire young high school students to continue their education, I was excited that we were able to host them at our facility. Our last tank finally arrived so between tours and other chores I helped Jeff do some of the bolting. 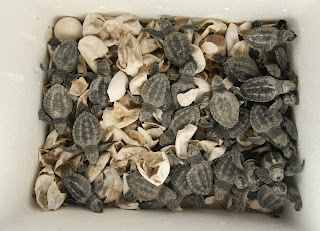 It's amazing how much the facility has grown and changed and I can't wait to see all the turtles in their new tanks. Today is Friday, which means fireworks here on the island. Hopefully I'll still remember when 9:15. My schedule will be interesting for the next week or so, I'm on corral duty this weekend and since we are expecting tons more babies it's looking like I'll be really busy. These pictures are of super active hatchlings from one of the in situ nests (which means it stayed on the beach rather than incubating in our corral) and the other is of Dave Cromwell with his turtle egg finding dog SPX. Downsize - materialism is stressful. Before we opened today someone called in to say that there was a Kemp's Ridley crossing Padre Blvd. Well if you're familiar with the island you know that Padre is the main street that goes down the island and if you're familiar with sea turtles you know there's no way that a sea turtle that is so awkward on land would waddle past the beach all the way to the road. So, Lucy went out to pick up the little land turtle whose species we are still debating. It kind of looks like a red-earred slider, but the red stripe doesn't quite look bright enough. Anyway, point being - not a sea turtle. However it's still fun to have new turtles brought in so I scrubbed him down to remove the algae from his shell and we snapped some pictures. I spent a chunk of my day working on updates for the website with Adrienne and Jeff, we needed to add pictures for the online giftshop and update the staff page. So we sent off all of the updates and hopefully everything will be fixed up soon. This afternoon we had our last tank delivered! This one is bigger than the new tank Merry Christmas is now in and they will work on bolting it together tomorrow. If everything goes well the plumbing will be finished up soon so we will be able to paint them, fill them and build up the deck around them. I don't really have much to do with the new tanks, that's mostly Tom's job, but I'm hopeing that I'll see the finished product by the end of my summer here. More pictures from Adrienne from when we cleaned Fred's tank, the one of his face is a little dark, but he's just so darn precious. There were a few highlights to my day though. I love the medical part of this job, it pains me to see a turtle flinch when we give an injection, but at the same time I find it so cool to get that experience. We have two turtles right now who are on serious meds for puncture wounds so they get a special soak and ointment everyday as well as fluids and antibiotics. One of those turtles, Roy, also gets an oral medication and we're always surprised by his strength despite the hole on the bottom of his shell. 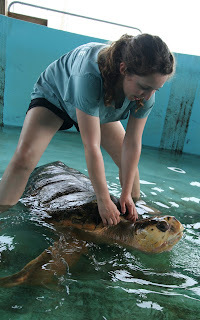 He can't weigh more than 6 or 7 pounds, but it takes four of us to hold his flippers and his head so that someone else can insert the tube and a fourth person can give him the medicine. Our other sick little guy, Todd, is the same size, but much skinnier and so today we began to force feed him in an attempt to put some weight on him. Unlike Roy he hardly fought us at all. 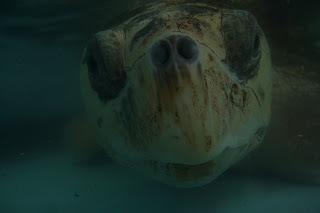 So far this summer I've put off mentioning a turtle incident on the beach because law enforcement has stepped in and we have been told to offer no comments to the press, making talking about it at all off limits. Since the incident all of the local news stations and news papers have been calling in and trying to get comments and information and it's been a bit of a bizarre experience for the interns. Well today another tv channel came in to talk to Jeff, but I was unfortunately the first person to speak to him. He was terribly frustrated that I refused to give him any information, though it wasn't actually an option for me. But to top things off this guy was dressed so poorly that he hardly looked professional. His ill fitting button down was rolled up to his elbow, but not evenly or neatly, and his tie was crooked, loose and the back part was longer than the front. So maybe he didn't the turtles were that important, but I'm not sure how he thought he was going to sway us to give a story dressed like that. Anyway, once the stress of that was over we did get a pretty good laugh about another interesting visitor. There was a young man who came into STI today dressed in an Elvis costume with a camera man in tow. It seems that he did was come in and talk to Jessica and Tom, two of the interns, and didn't even take a tour. The story as I heard it was that he came in, introduced himself as a daredevil and had the two of them offer him a dare, all off camera. When Tom suggested bungee jumping off of the bridge or from Louie's bungee tower "Elvis" shot down both ideas. As they were talking about SPI activities they mentioned snorkeling as a popular activity. So then Elvis said, "ok when I ask for a dare on camera say that" and they began shooting, Elvis introduced Tom and Jessica, talked to them for a minute about snorkeling, than took off. As he left we had the obligatory "Ladies and gentlemen, Elvis has left the building" and that was it. We have no idea who he is or what the interview was for. Bizarre. I've been receiving emails, comments and mail, thank you so much to everyone, it means so much to me. 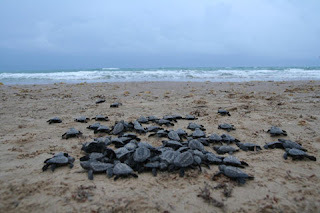 Today's pictures are from Brian who was at one of our hatchling releases earlier this season, thank you Brian! Take time to get gain some perspective. Today was another same-old sort of day. It was just interns today so we had a good time and I gave two more Spanish tours, which are increasingly better with practice. I miss talking speaking Spanish so much and unfortunately this is more or less my only opportunity so I'm learning to enjoy it. The second family I talked to today had two or three young kids and another high school aged kid. At some point the older child was clearly holding back a little laughter so I said something like, "hey give me a break I'm trying" and he shut up really quickly. Bless his heart I think I embarrassed him a little, though I hadn't taken it personally - it's not the first time someone has laughed at my Spanish and it won't be the last. And quite frankly I'm proud of my ability to speak at the level I'm at, so there. But that wasn't an invitation for a challenge, please be kind! I think the highlight of my day was a little STI factoid I learned. We get by on the generous donations of our visitors and the public, but there are a few groups and organizations who send very large annual contributions to help us out. So, I assumed that part of these donations we receive every day went to pay for my paycheck. As it turns out the money I use to pay for groceries and rent comes from Bubba Gump. Now granted all I know about the Bubba Gump Corporation is from the movie with Tom Hanks, but I learned that they donate 2 cents from every dinner ordered to Sea Turtle, Inc. and then that money goes to pay the salaries of our interns. What a bizarre connection. Ok I'm off, I have to wrap our house-warming gift for Adrienne and Tom and get my pancake ingredients together for dinner. Thankfully I'm off tomorrow so I'll be sleeping in late and maybe finishing a book and doing laundry. These are more of Adrienne's pictures, some more babies and the picture of Fred that will be gracing a postcard soon. Smile - never doubt how much that can improve someone's day.